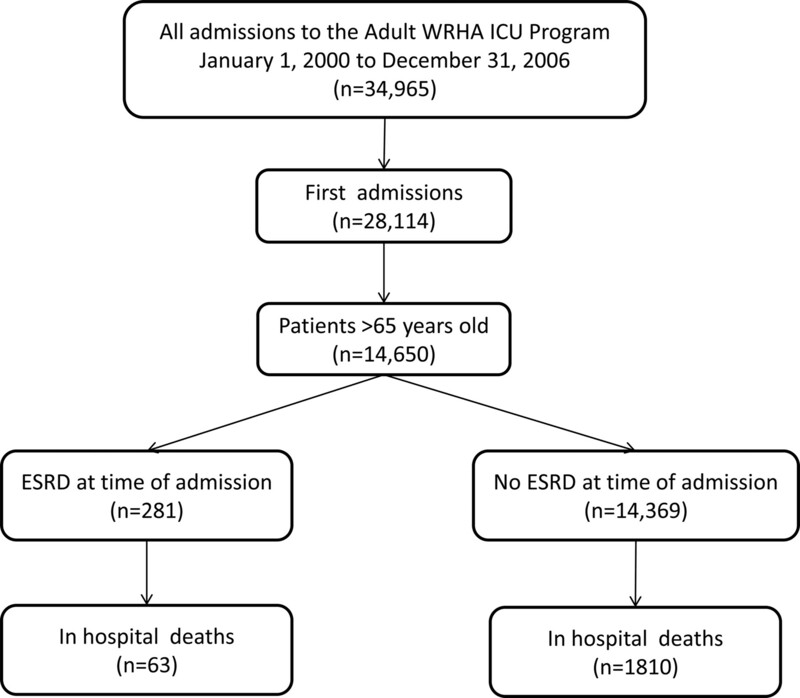 Background and objectives Elderly patients (>65 years old) are a rapidly growing demographic in the ESRD and intensive care unit (ICU) populations, yet the effect of ESRD status on critical illness in elderly patients remains unknown. Reliable estimates of prognosis would help to inform care and management of this frail and vulnerable population. Design, setting, participants, & measurements The effect of ESRD status on survival and readmission rates was examined in a retrospective cohort of 14,650 elderly patients (>65 years old) admitted to 11 ICUs in Winnipeg, Manitoba, Canada between 2000 and 2006. Logistic regression models were used to adjust odds of mortality and readmission to ICU for baseline case mix and illness severity. Results Elderly ESRD patients had twofold higher crude in-hospital mortality (22% versus 13%, P < 0.0001) and readmission rate (6.4 versus 2.7%, P = 0.001). After adjustment for illness severity alone or illness severity and case mix, the odds ratio for mortality decreased to 0.85 (95% CI: 0.57 to 1.25) and 0.82 (95% CI: 0.55 to 1.23), respectively. In contrast, ESRD status remained significantly associated with readmission to ICU after adjustment for other risk factors (OR 2.06 [95% CI: 1.32, 3.22]). Conclusions Illness severity on admission, rather than ESRD status per se, appears to be the main driver of in-hospital mortality in elderly patients. However, ESRD status is an independent risk factor for early and late readmission, suggesting that this population might benefit from alternative strategies for ICU discharge. Elderly patients are a rapidly growing demographic in the ESRD and intensive care unit (ICU) populations (1–4) and pose a substantial burden on ICU and dialysis resources. These trends may reflect a global paradigm shift in medicine as more intensive treatment therapies are being performed in elderly patients with high burdens of comorbidity and increased frailty (1). From a clinical perspective, accurate estimates of prognosis would help to inform care and management of critically ill elderly dialysis patients. Several small and two large studies have described outcomes of ESRD patients admitted to the ICU (5–12). ESRD status was associated with an approximately twofold higher mortality, but this effect was largely attributable to case mix and illness severity variables. These studies did not specifically examine an elderly cohort, a vulnerable subpopulation that might be more susceptible to any adverse effect of concomitant ESRD status. We hypothesized that in elderly patients admitted to the ICU, ESRD status would be independently predictive of adverse outcome (death, readmission to ICU) after adjustment for case mix and illness severity. The main objective of the study presented here was to describe the admission characteristics and adjusted odds of death and readmission attributable to ESRD status in a prospective cohort of elderly patients admitted to the ICU. The study was approved by the University of Manitoba Health Research Ethics Board. The study population consisted of all adult patients over the age of 65 admitted to any of the 11 ICUs serving the city of Winnipeg, Manitoba, Canada over a 7-year period from January 1, 2000 to December 31, 2006. Winnipeg is the tertiary care referral center for the entire province of Manitoba (2006 census population 1,148,400). The derivation of the study cohort is described in Figure 1. Strobe diagram showing patients included in the analysis. WRHA, Winnipeg Regional Health Authority. The ICUs included two primarily surgical and nine primarily medical ICUs. Significant overlap in the type of patient treated in surgical versus medical ICUs frequently occurred because patients were often transferred between designated surgical and medical ICUs in accordance with bed availability, irrespective of diagnosis. Seven of the ICUs were in tertiary care teaching hospitals, whereas four ICUs were in community hospitals. The ICUs at the two teaching hospitals were dialysis capable, whereas the community ICUs were not. All patients requiring dialysis (chronic or acute) were transferred as soon as possible to one of the dialysis-capable ICUs. High-acuity patients without renal failure were also routinely transferred to the tertiary care teaching hospitals to access services not available in the community. All ICUs were closed units managed by an intensivist and a dedicated ICU staff. Nephrologists managed all renal replacement therapy (intermittent hemodialysis or continuous venovenous hemodiafiltration). The electronic database for the ICUs is a regional, prospectively maintained database of all patients admitted to any of the 11 ICUs in Winnipeg. All clinical data, elements of the Acute Physiologic Assessment and Chronic Health Evaluation II (APACHE II) score, and laboratory values are entered by one of several trained full-time research assistants employed by the regional ICU program. The attending intensivist reviews clinical admission and discharge diagnoses. The database tracks patients from ICU admission to death or hospital discharge. Research assistants audit all data sheets for completeness at the time of discharge from the ICU and at hospital discharge. If necessary, a chart review to identify missing data elements is performed. Collected data include patient demographics; admitting and discharge diagnoses (primary and up to five secondary diagnoses for each); illness severity indicators including all elements of the APACHE II and European System for Cardiac Operative Risk Evaluation scores on admission; admission serum creatinine, electrolytes, and complete blood count; daily Therapeutic Intervention Scoring System (TISS) scores to quantify type and number of ICU interventions; disposition; and in-hospital survival. Because data collection for the database is mandatory, and because the ICU population is intensively observed and tracked clinically, baseline data and in-hospital outcome capture was 100% for all elements in the database. The primary exposure of interest was ESRD status at time of admission, defined as receiving dialysis for at least 6 weeks before admission to ICU. Elderly status was defined as age >65 years. The main outcomes of interest were in-hospital mortality and readmission to ICU. Readmission was defined in two ways: readmission within 72 hours and readmission within the hospitalization period after ICU discharge. Secondary outcomes included length of stay and TISS scores. The TISS (13), which quantifies type and number of ICU interventions and is an accepted measure of ICU resource utilization and workload, was calculated and entered daily into the ICU database. Continuous variables of interest were summarized as mean (SD). Dichotomous variables and outcomes were summarized as percentages. t tests and ANOVA were used to compare normally distributed measures. The Mann–Whitney U test and the Kruskall–Wallis test were used for nongaussian distributions. The χ2 test was used to compare dichotomous variables. We used multiple logistic regression to adjust the odds ratio (OR) for death associated with ESRD status for potential confounders. We created models adjusting separately for case-mix variables, illness severity variables, and both. To avoid potential distortions due to the nonindependence of repeated admissions, we restricted the analysis to first admissions. We carefully reviewed the ORs and confidence intervals of all covariates in each model to identify extremely large or small values that might indicate overfitting, and we confirmed, using crosstabs of covariate category by ESRD status by outcome status, that there were no sparse categories (i.e., cells with <5 outcomes). In separate sensitivity analyses, we (1) restricted the analysis to tertiary care centers only and (2) used a propensity-matched method to adjust for covariate differences between ESRD and non-ESRD (14). In the propensity analysis, we created a logistic model for ESRD based on case-mix and illness severity variables, and then matched ESRD patients 1:1 to non-ESRD patients having similar logistic scores (i.e., within 0.01). We then calculated the OR for death associated with ESRD status in this propensity-matched cohort using unconditional logistic regression. In patients surviving to discharge from ICU, we derived adjusted ORs for readmission as for the mortality models above. We also derived reduced logistic models predictive of readmission within 72 hours and within the same hospitalization using forward stepping operative on the entire pool of case-mix and illness severity variables. Variables were retained in the reduced model if the coefficient P value was <0.05. All analyses were performed using SAS 9.1.3. Between January 1, 2000 and December 31, 2006, 14,650 elderly patients (>65 years of age) were admitted to one of 11 ICUs in Winnipeg, Manitoba, Canada. Of these, 281 (1.96%) had ESRD at the time of admission (Table 1). The average age of the ESRD patients was 74 years and 45.6% were women. Elderly ESRD patients had more comorbid illness, including diabetes mellitus and peripheral vascular disease, than elderly non-ESRD patients. Sepsis and cardiac arrest were more common in the elderly ESRD cohort whereas multiorgan failure rates were similar. On admission, the elderly ESRD cohort had lower mean BP and hematocrit and higher white blood cell counts. APACHE II scores were higher in the ESRD cohort. This difference persisted even if the renal component was subtracted from the APACHE II scores (data not shown). Resource utilization, measured by TISS (13), was similar between groups. Crude outcome rates are depicted in Table 2. In-hospital mortality was almost 2 times higher in the elderly ESRD cohort compared with the elderly non-ESRD cohort. There was a nonsignificant trend toward longer stay. Table 3 summarizes the effect of adjustment on the association between ESRD status and in-hospital mortality. Adjustment for case mix alone did not alter the association between ESRD and mortality (model 1). However, adjustment for illness severity variables attenuated the association (model 2), as did adjustment for case-mix and admission characteristics (model 3). All logistic mortality models exhibited good fit and discrimination. In the sensitivity analyses, the OR calculated from a propensity-matched cohort was 0.78 [0.530 to 1.15]). When the analysis was restricted to tertiary care hospitals, the OR was similar—0.79 [0.50 to 1.25]. Stepwise examination of the model showed that APACHE II score, serum creatinine, sepsis, and serum potassium had the largest influence on the adjusted OR for death associated with ESRD. Eighty-eight percent of the elderly cohort survived the first ICU admission. Of these, 357 (2.8%) required readmission within 72 hours of ICU discharge and 847 (6.6%) were readmitted during the index hospitalization. Unadjusted rates of readmission to the ICU for these patients are compared in Table 2. Elderly ESRD patients discharged from the ICU were roughly twice as likely to require readmission within 72 hours and during the index hospitalization. This effect persisted after adjustment for case-mix and illness severity variables (Table 4). We derived reduced logistic models using forward stepping to identify other predictors of readmission to the ICU (Table 5). In addition to ESRD, patients with peripheral arterial disease, sepsis, multiorgan failure, low hematocrit, hypothermia, tachycardia, and decreased Glasgow coma score were at greater risk of readmission. Increasing age was associated with slightly lower odds of early or late readmission. Although the models were highly statistically significant, the areas under the receiver operator characteristic curve were <0.75 for all readmission models. The major findings of our study were (1) ESRD status was associated with elevated crude mortality in an elderly cohort, (2) the higher mortality was attributable mostly to the higher illness severity on admission to ICU in elderly ESRD patients, and (3) ESRD status was associated with a twofold higher odds of requiring readmission to the ICU even after adjustment for case-mix and illness severity variables. We hypothesized that ESRD status would be independently associated with higher mortality. However, although ESRD status was clearly associated with a twofold higher crude rate of death, most of this effect appeared to be due to confounding by differences in admission characteristics. Adjustment for these factors (Table 3) largely eliminated the association between ESRD status and death. Overall, our observations on mortality are congruent with those of previous studies examining the effect of ESRD in a more general ICU population (5–12). These studies reported crude ICU mortality rates for ESRD ranging from 14% to 52.6%, bracketing our estimate of 22%. Three of these studies (5,9,15) also performed adjustment for case mix and illness severity and reported a similarly large attenuation of the association between ESRD status and death after adjustment, with adjusted ORs ranging between 0.9 and 1.25. These values lie within the confidence limits of the estimates in the study presented here (Table 3). It is interesting to note that adjustment for differences in case mix alone did not attenuate the association, whereas adjustments for illness severity factors did, suggesting that the latter is the major driver of the excess mortality observed in elderly ESRD patients. These observations are very consistent with the general ICU literature, which suggests that degree of acute physiologic and metabolic derangement (e.g., “illness severity”) is the major determinant of ICU prognosis. Need for readmission to ICU is associated with poor outcome and may be a marker of quality of care (16,17). The observed readmission rates in our elderly cohort were similar to those reported in the literature for general ICU cohorts (16,17). We found that ESRD status was significantly associated with a higher rate of readmission in this elderly cohort. In those patients surviving to discharge from ICU, early and late readmission rates were roughly twofold higher in the ESRD patients. Moreover, ESRD status remained a strong independent risk factor for readmission even after multivariate adjustment. It seems plausible that increased frailty and burden of comorbid illness hinder recovery from critical illness in this population. These observations are novel and may be helpful to clinicians caring for elderly ESRD patients approaching readiness for discharge from the ICU. Furthermore, these findings suggest that interventions aimed at preventing ICU readmission (e.g., delayed discharge, discharge to a “step-down” unit, or follow-up by an ICU outreach/triage team) might improve outcome in these patients. Further randomized trials are needed to determine strategies to prevent readmission in this vulnerable population. In addition to ESRD status, we identified several comorbid conditions and measures of illness severity as independent risk factors for readmission (Table 5), findings congruent with the general ICU literature (18, systematically reviewed in 16). As with all of these previous studies, although our models were highly statistically significant, model predictive power was low (areas under the receiver operator characteristic curve < 0.75). Inclusion of predischarge variables, which were not available to us, might have improved model discrimination. Interestingly, within this elderly cohort, each year of age above the median was associated with a small but significant decrease, approximately 2% per year, in odds for readmission. This is at variance with the general ICU literature, in which each yearly age increment was associated with an increase of 1% in odds of readmission in one study (16). We can only speculate that this may reflect a bias against readmission of elderly patients, as has been suggested by Hutchinson et al. (5). The key strengths of our study include the large population of elderly studied, the large number of elderly ESRD patients relative to the published literature, and the completeness of follow-up, case-mix, and illness severity data available. The capture of elderly ESRD patients admitted to ICU was likely nearly complete because any ICU patient requiring dialysis was automatically transferred to Winnipeg. However, several important limitations must be mentioned. First, despite the large size of our cohort, only 281 patients had ESRD, of which 63 died. The relatively small size of this category limits the precision of the estimated OR for death associated with ESRD, resulting in wide confidence limits. For example, the true adjusted OR in the fully adjusted model (Table 2, model 3) could be as high as 1.23 (i.e., the upper 95% confidence interval). The result of the propensity analysis is reassuring because the upper 95% confidence interval there was closer to 1 (1.15), making it less likely that a true increase in risk was missed. Second, we cannot know which or how many ESRD patients were declined for admission to ICU and whether the criteria for admission differed systematically from those applied to non-ESRD patients. It is possible that only “good” elderly dialysis patients were selected for admission and thus that outcomes observed in the study are not reflective of all dialysis patients who were potential ICU candidates. Third, we analyzed data from an existing clinical database of ICU patients. Clinical databases often suffer from missing or inaccurate data. However, the database used for this study was comprehensive and prospective, with mandatory data entry by dedicated program research nurses as part of the admission process, leading to complete capture of data elements. Fourth, we used a more liberal definition of ESRD in our study (6 weeks on dialysis versus 12 weeks) than has been used in large registry studies. This may have biased our ESRD group toward inclusion of sicker patients with higher mortality. However, the direction of this bias (i.e., overestimation of true mortality associated with ESRD status) is unlikely to alter our conclusions. Fifth, we used in-hospital mortality as our primary outcome measure. This statistic probably underestimates true mortality because some patients may have died after hospital discharge. Finally, our results describe observations in a single region, and thus generalizability across other regions of the United States and Canada has not been directly established. Nevertheless, our results with respect to mortality were congruent with studies in the general ICU population conducted elsewhere. In conclusion, the mortality of elderly ESRD patients in the ICU, although twofold higher than those in elderly non-ESRD patients, appears driven primarily by illness severity factors at the time of admission rather than ESRD status per se, an observation consistent with those in general ICU cohorts. However, need for readmission remained twofold higher in ESRD after adjustment for other significant confounders, suggesting that these patients might benefit from longer observation in the ICU or other strategies to decrease morbidity. C.R. and M.S. conceived and designed the study and wrote the first draft of the manuscript. J.M. analyzed the data and critically reviewed the manuscript. P.K., J.B., M.R., and D.R. critically revised several iterations of the analysis and manuscript and contributed significantly to the intellectual content of the paper. U.S. Renal Data System: USRDS 2008 Annual Data Report: Atlas of Chronic Kidney Disease and End-Stage Renal Disease in the United States, Bethesda, MD, National Institute of Health, National Institute of Diabetes and Digestive and Kidney Disease, 2008.